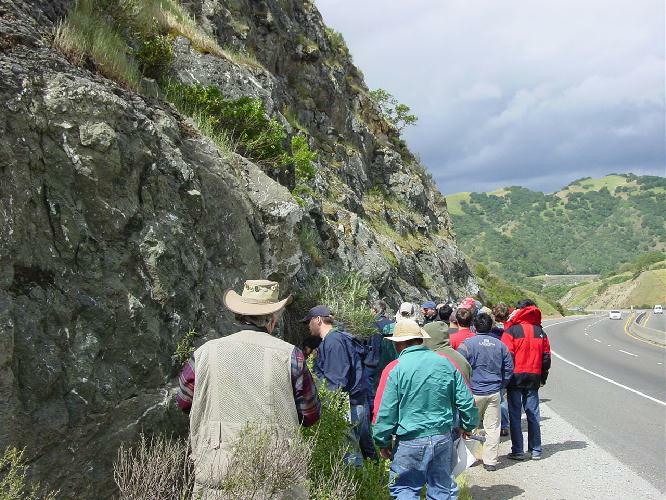 A stratigraphically coherent section of Franciscan metasedimentary rock is well exposed in the Diablo Range at Pacheco Pass east of Gilroy. This section was exhumed from depths of 20 to 30 km in a Mesozoic subduction zone. On Saturday, April 12, NCGS members and friends joined Professor Gary Ernst and his students from Stanford University on a field trip to this area. We were also joined by Dr. Juhn G. (Louie) Liou’s class of petrology students. Our day began on a rainy spring morning at the Fremont Park and Ride lot. 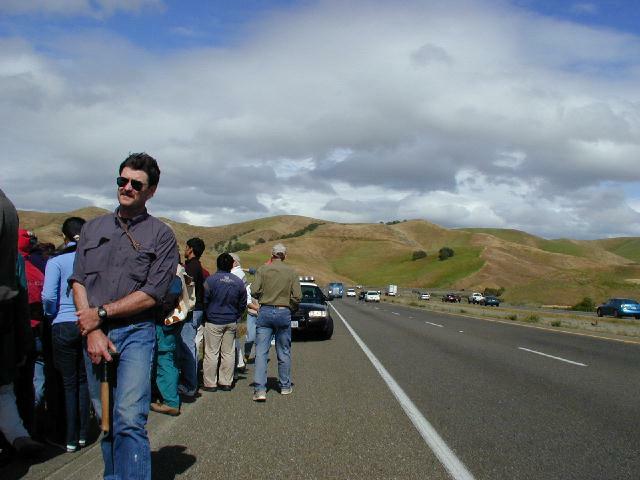 After being fortified by coffee and donuts supplied by Phil Reed, we drove to Casa de Fruita east of Gilroy where we met with Dr. Ernst and his students. Gary began by giving us an overview of the Franciscan Complex in the Diablo Range. 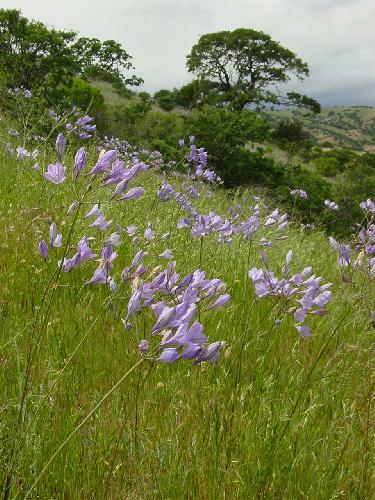 The Diablo Range is part of the California’s Coast Range. The Franciscan represents the trench complex of a Mesozoic, east-dipping subduction zone. Coeval with the formation of the subduction complex was the development of a volcanic arc, whose roots are the Sierra Nevada batholith. 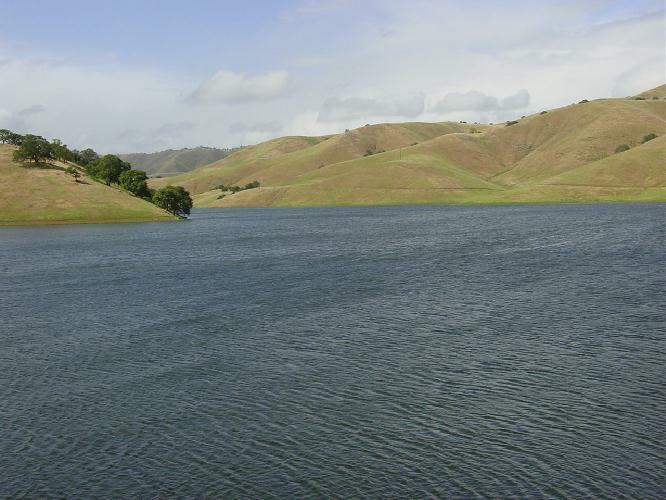 The Central Valley represents the forearc basin of the subduction system. The Franciscan Complex is a package of rocks formed in an upper Mesozoic subduction zone. It consists of sediments deposited in an accretionary prism (imbricated ocean trench deposits) as well as the sections of the underlying oceanic crust and mantle. Ages range from uppermost Jurassic through Cretaceous. 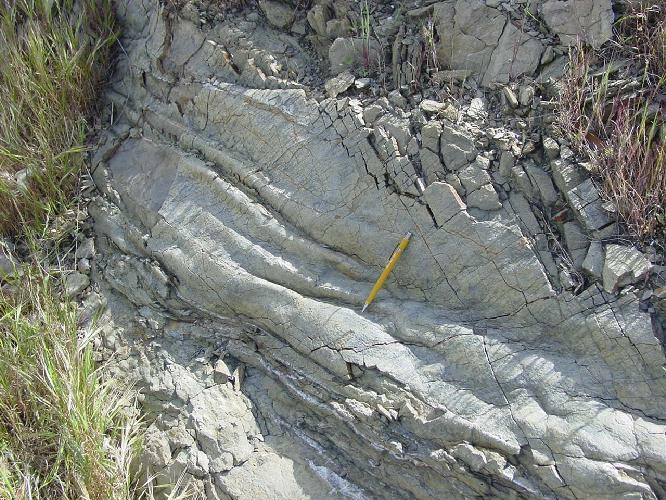 The sediments of the accretionary prism are medium- to fine-grained detrital rocks (graywackes, micrograywackes, and dark shales) that were sourced from the Sierran volcanic-plutonic arc, and they were deposited into the trench as turbidites. In the subduction process they have been metamorphosed into metagraywackes. The ocean floor rocks are represented by radiolarian chert, pillow basalts and pillow breccia, and peridotite (oceanic mantle). These have been metamorphosed into metachert, greenstone, and serpentine, respectively. 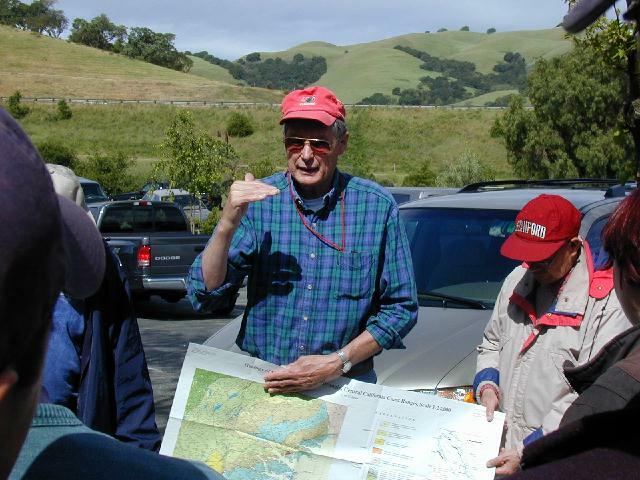 Gary mapped the geology of the central Diablo Range in the Pacheco Pass quadrangle. 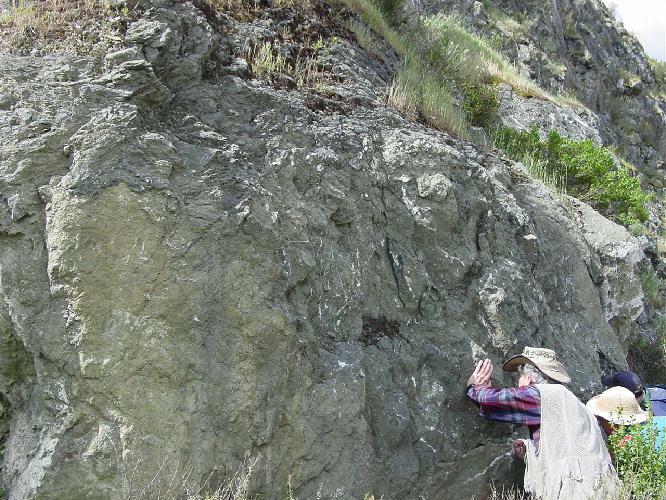 The terrane consists predominantly of Franciscan metagraywackes and finer grained metaclastic rocks. The Franciscan is divided into 4-5 packages separated by a series of subhorizontal bedding-pane thrusts. The thrust detachment at the base of each tectonic unit is mapped below a zone of mafic blueschist with overlying metachert. Gary has interpreted each package as a thin thrust slice dipping to the east. The packages are interpreted as getting older to the east. The oldest package is bound on the east side by the “Coast Range Thrust” represented here by the Ortigalita fault. East of the fault lies the Great Valley Series. One of the best techniques to determine the depth of burial is by examining the petrology and geochemistry of the minerals in the metagraywackes. The albite present in the original sedimentary and igneous rock has been converted into jadeitic pyroxene plus quartz. This reaction can only occur in a high pressure, low temperature environment. Laboratory experiments indicate temperatures of about 200°C and pressures of about 6-7 kilobars. This corresponds to depths of about 20 to 30 km in a subduction zone. The process for getting the subducted oceanic crust back to the surface (exhumation) is not well understood. Whatever the process, it must be rapid on order to preserve the high-pressure, low temperature minerals. Gary favors a process propelled by buoyancy. Jadeitic pyroxene is less dense and more viscous than olivine that occurs in the mantle. This difference in buoyancy allows the subducted crust to rise. 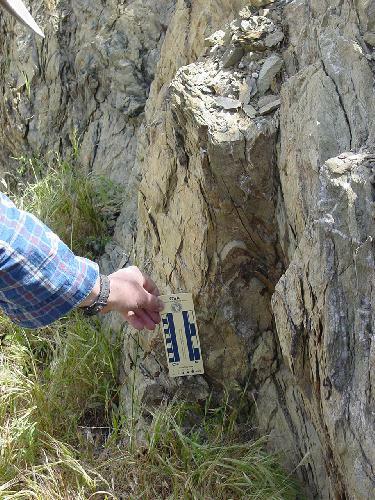 More remarkable is the fact that these tectonic blocks, some at least 10 km, have been returned to the surface from such depths relatively intact (stratigraphically coherent). Stop 1 was located about 8 miles west of Casa de Fruita on Highway 152. Here we examined a large outcropping knob. 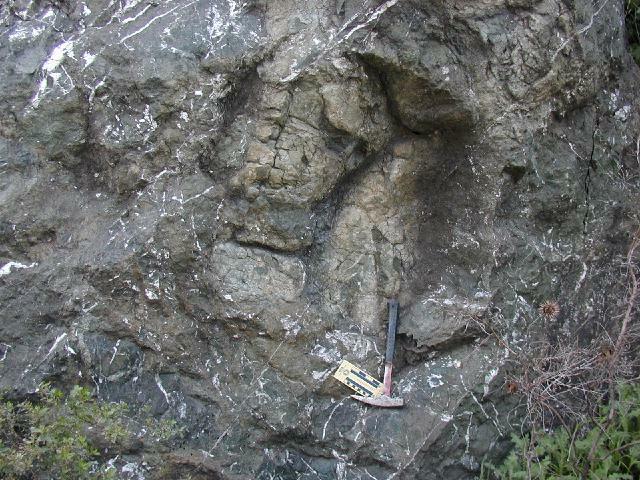 The knob consists of greenstone blocks surrounded by metasediments. Greenstone is weathered basalt and everyone could see outlines of good pillow structures. 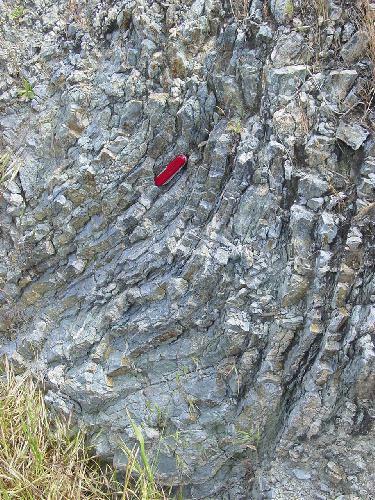 The basalts are only slightly metamorphosed (epidote and chlorite facies). These blocks represent weakly recrystallized oceanic crust, possibly a seamount that was subducted into the trench. Often these greenstones are quarried for highway gravel, but not at this location. The blocks are surrounded by metagraywacke and metashale. In hand specimen, the metagraywacke is not obviously a blueschist facies rock. However, the diagnostic minerals are easily visible in thin section. 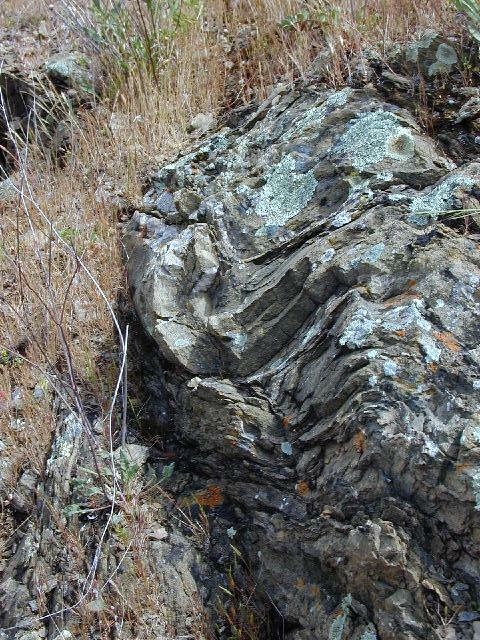 Other blueschist facies minerals such as lawsonite, glaucophane and aragonite occur in this rock. 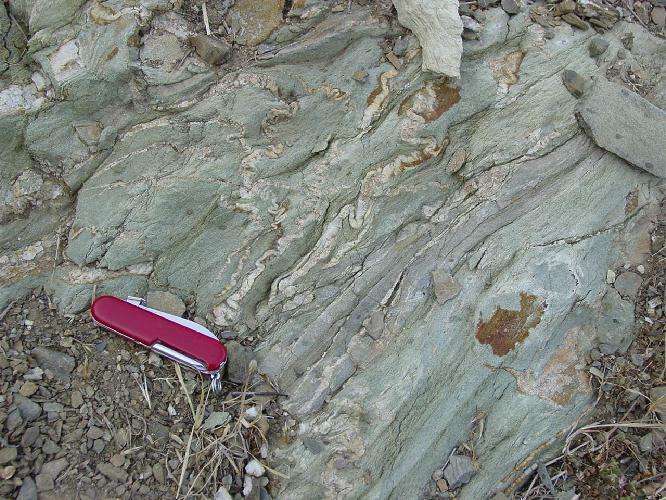 The quartz veins were dramatically exposed in the outcrop and represent the conversion of albite into jadeite and quartz. For Stop 2 we drove east and turned off onto Old Highway 152. We stopped at an outcrop of weathered metagraywacke. Here the metagraywacke is relatively coarse-grained and the goal was for everyone to see the jadeitic pyroxene in hand specimen. Under a hand lens the jadeite here is tan- to flesh-colored with a pearly luster. Grains appeared as fibrous radiating sprays and prismatic clusters. Jade is a rock composed of mineral jadeite and is an important ornamental gem. Ornamental jadeite is only found in metamorphic rocks of tectonic convergence zones, usually as alluvial pebbles or boulders. 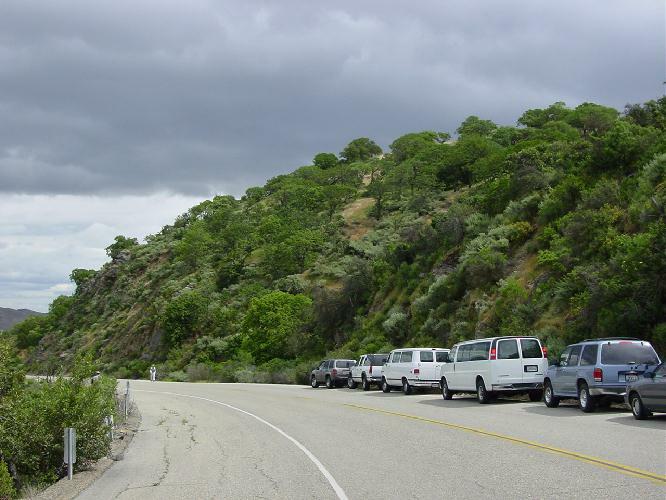 In California boulders have been found in near New Idria and Big Sur. All Mexican jadeite is in carved objects, but its source is not known. However, it is known that Guatemala was an important source of jade, providing the material for the carvings of the Central American Indians, and now it is mined in there. “Chinese” jadeite is found in stream beds in Myanmar (Burma). It has been found in place at one locality in Japan. Stop 3 was further east at the end of Old Highway 152 where we stopped at the Dinosaur Point parking lot overlooking the San Luis Reservoir. The wind was howling across the reservoir as we ate lunch. Gary pointed out a metagabbro that intruded into the metagraywacke. This sparked a discussion of how a mafic magma could be injected into a turbiditic accretionary prism prior to subduction-zone metamorphism and subsequent exhumation. Returning back to Highway 152 we headed further east to Stop 4. We examined a section of metagraywacke, metachert and greenstone-blueschist. The metachert is an unusual blue color due to the presence of riebeckite, a blue amphibole. 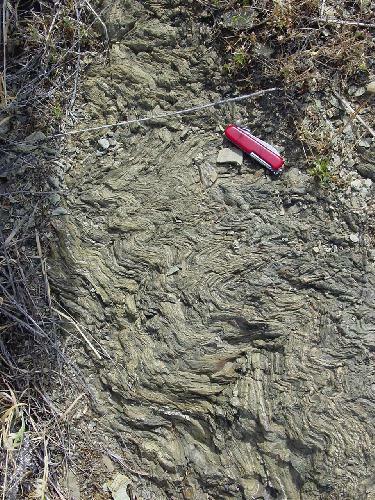 The greenstone has a glaucophane mineralization on the fracture surfaces. Glaucophane is a blue amphibole, and is found only in metamorphic rocks. Like jadeite, the occurrence of glaucophane reflects high-pressure, low temperature metamorphic conditions. 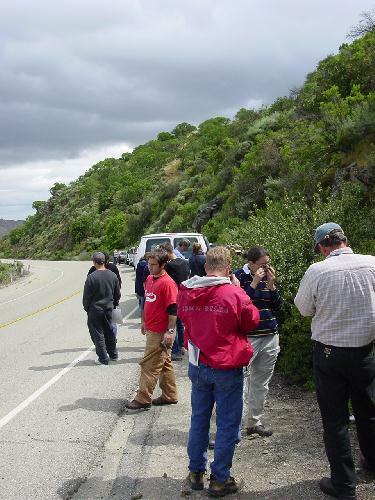 Then we walked to an overlook of the highway on the south limb of an east plunging antiform. 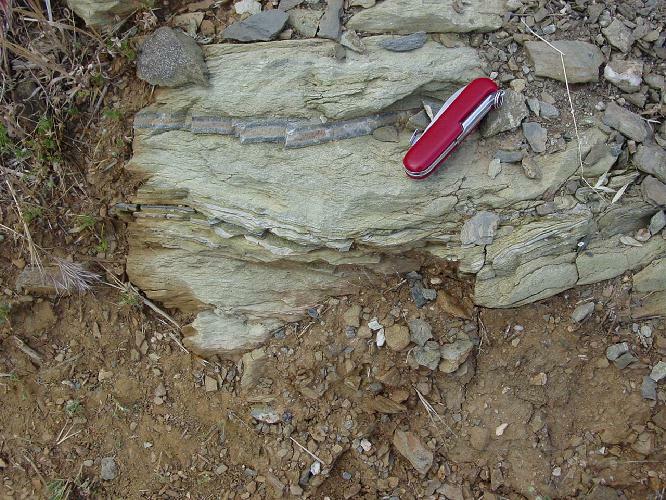 The Franciscan section here consists of siliceous shale overlying chert, in turn overlying greenstone. For Stop 5 we continued east along Highway 152 until we crossed the Ortigalita fault. 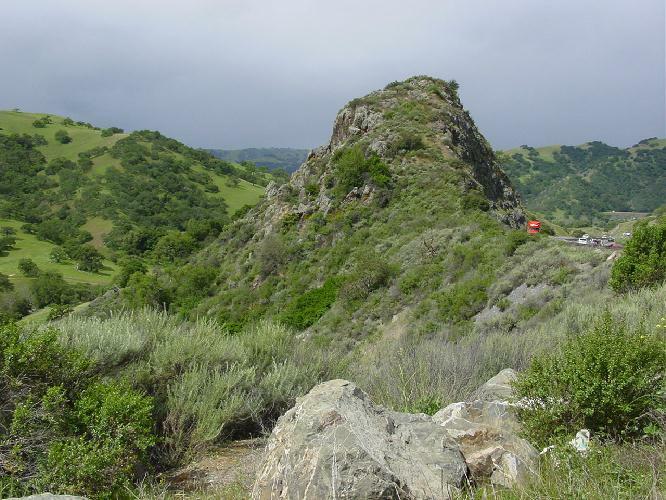 The fault is the so-called Coast Range thrust, and marks the boundary between the Franciscan Complex and the upper Cretaceous Great Valley Series. Here the Great Valley Series is steeply east-dipping, weakly metamorphosed conglomeratic sandstones and siltstones. This material was derived from the Sierran arc located to the east. Mineral assemblages indicate the Great Valley was buried to only about 10 km versus the Franciscan burial depth of about 20 to 30 km. 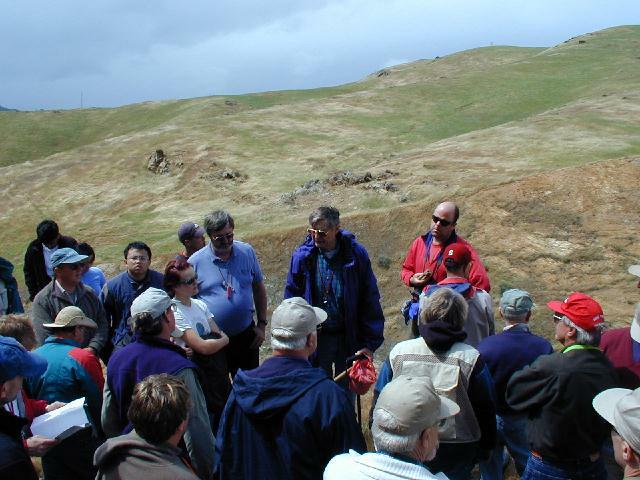 These different burial depths are found all along the Coast Range thrust. We then continued eastward for a brief stop at the Romero Visitor Center. 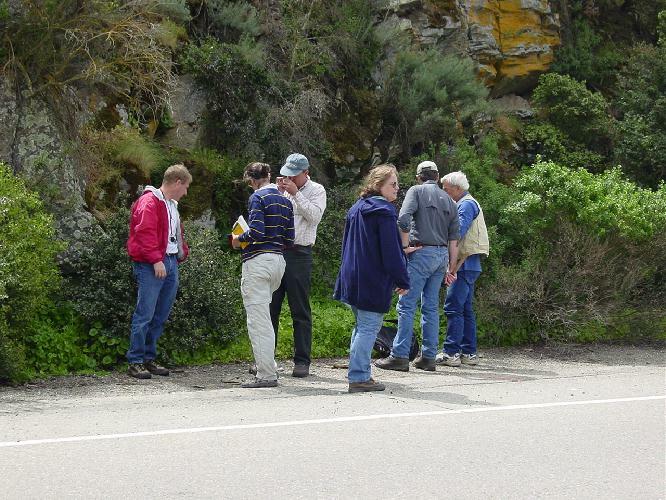 Stop 6 was located at the first Franciscan outcrop west of the Ortigalita fault. Gary pointed out the trace of the fault across the countryside. 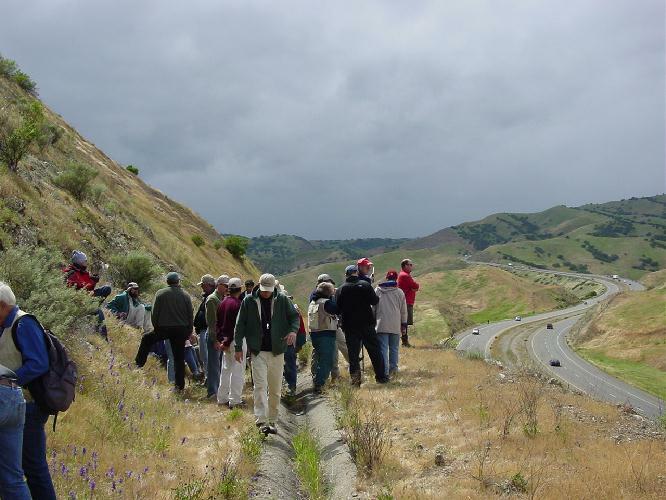 It was marked by a change in vegetation, style of erosion, and drainage pattern on either side of the fault zone. The Franciscan here consists of metagraywacke along with siltstones and tuffaceous units. Throughout the day our group managed to avoid the rain showers that covered most of the Bay Area. However, our luck finally ran out as it began to rain at the end of Stop 6. We said farewell to our Stanford friends, and they returned to Stanford for the night before venturing out again the next day. The NCGS sincerely thanks Dr. Ernst for allowing us to join his class on this excellent field trip. 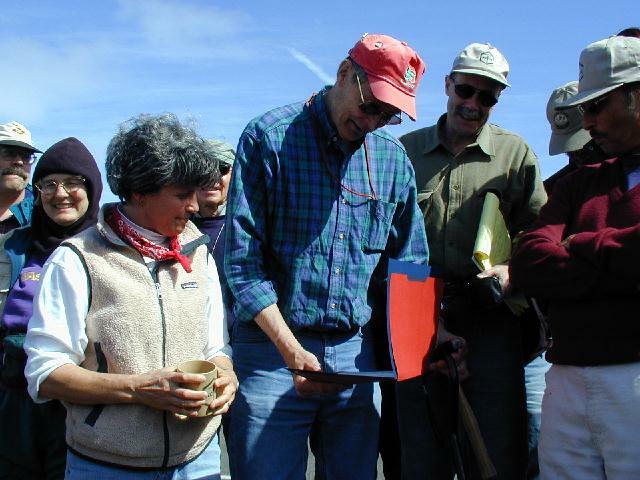 His field guide describes the trip in detail and includes a colored geologic map of the area. We thank Jean Moran for another wonderful job in organizing the trip, handling trip registration, arranging transportation and food. Finally, we thank all of the drivers for use of their cars and vans. Photos provided by Mark Detterman and Keil Albert.